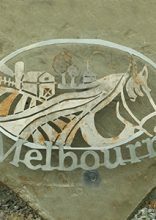 The concept of the new logo for the Township of Melbourne presents in the foreground a horse whose mane lengthens out to become the valleys of the Melbourne region. The horse is hitched (with the working neck collar), to reflect that horses were an invaluable ally in the agroforestry industry in the area. This character will become a reference to which we will become attached and by which Melbourne will identify itself and will be easily recognized. The horse also pays tribute to the painter Frederick S. Coburn, who used horses as a main subject. In the landscape, behind the horse, we find the St-François River in blue which winds through the valley, a brick red farm with its farmlands (fields with the green furrows) as well as the Saint Andrew’s church and trees, all distinctive and representative elements of the municipality. The slate color is also used in connection with the slate mines of the area. The ochre yellow horse mane also represents hay and/or maple syrup. This logo shows the joyful and rural side of Melbourne and will weather the test of time.